So Holly and Loyce are my heroes (heroines to be exact, but that just sounds weird). Why? You ask. Because they introduced me to Twilight. I hesitate to tell you more than the title of this book for fear you'll doubt it as much as I did when I first heard about it, but I PROMISE you'd be pleasantly surprised if you decided to read it. It is wonderful. So here goes a quick and dirty description of the book. The book is young adult fiction (like Harry Potter, but better.) Twilight is about a young girl who falls in love... with a vampire. (Yes! I know that is weird. That's why I hesitated.) It's hard to explain, but the vampire aspect of this book isn't what makes it so outstanding. It's the simplicity and sweetness of their new love. I couldn't help but grin from ear to ear while I read it. 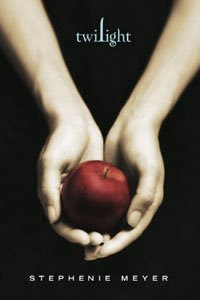 I have started the second in the series called New Moon and it is equally great but in different ways. Please. I am begging all women who read this blog. Please read this book. Read the series. Pre-order your copy of the fourth and final book in the series due to be out on August 2nd. It is just too great. I love it! Things continue to be busy for us Joneses. We had antoher great weekend celebrating Farron's 50th Birthday and picnicing with Bobbie for Mother's Day. Here are a few pics. For Farron's Birthday, Bobbie set up a surprise dinner at Cristina's. He was such a good sport and wore his "Old Fart" hat and pin proudly! This pic isn't great but it was a LOT of work so I just had to include it. Along with the fam in this picture are a couple of Farron's good friends from work who came to help us surprise him. This is what we did... played and lazed around. We hope you all had as great of a weekend as we did! It is strange how music can mean so many different things. God used this song to touch my heart and bring me joy and peace today. I hope He touches you today too!